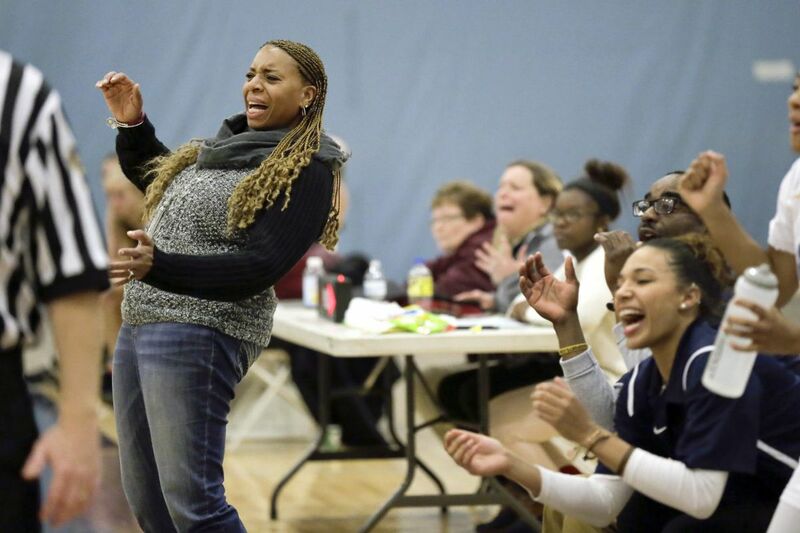 Springside Chestnut Hill Academy girls basketball coach Flo Hagains (left) led her squad to a win over Baldwin on Thursday. Anthony Brown and Tyler Spann scored 40 and 31 points, respectively, to lead the String Theory boys' basketball team past Eastern University Charter, 93-80, on Thursday. Darnell Ransom made 21 free throws in defeat. Karee Davis-Combs finished with 21 points and made two free throws with three seconds left to give Mastbaum a 52-51 win over Paul Robeson. Andres Adorno and Carlos Morales scored 22 and 19 points, respectively, as Esperanza rolled to a 54-39 win over CAPA. Adorno and Morales combined to make seven three-pointers for Esperanza, which has won three in a row. Nafee Wilson added five points and 11 rebounds. Damien Sears hit two free throws with 50 seconds remaining to give Boys' Latin a 47-45 victory over Northeast. He finished with 14 points. Andre Davis made seven three-pointers en route to 34 points as Parkway Northwest took down Randolph, 79-68. Marquis Moore added 24 points. Jymir Thompson recorded 26 points, five assists, and two steals as Dobbins beat GAMP, 74-35. Nasir Ford led with 36 points as Pennsylvania School for the Deaf took down New York School for the Deaf, 49-41. Roynell Payne notched 10 of his 22 points in the fourth quarter to lead Sayre past Parkway Center City, 43-39. Caroline Clark made two free throws with six seconds left to give Springside Chestnut Hill a 41-40 victory over Baldwin. Anajah Brown had 16 points, 17 rebounds, and six blocks in defeat. Danielle McCurdy recorded 21 points and 12 rebounds as Archbishop Ryan beat St. Hubert, 59-46.